East West Players (EWP), the nation’s longest-running professional theater of color and the largest producing organization of Asian Pacific American artistic work, celebrates “Radiant,” its 51st anniversary season, with the annual Visionary Awards Dinner and Silent Auction. Recognizing the achievements of individuals who have raised the visibility of the Asian Pacific American community through their craft, the gala fundraiser takes place on Monday, April 24, at the Hilton Universal City. Proceeds benefit EWP’s educational and artistic programs. Ken Jeong, actor, producer and writer. Known for his scene-stealing abilities, he has established himself as one of today’s top comedic stars. In 2009, Jeong appeared as the mobster Mr. Chow in the sleeper-hit comedy “The Hangover,” which earned him three Teen Choice nominations and an MTV Movie Award. He reprised the role in two sequels. Jeong’s career path started off on a different course, earning his undergraduate degree at Duke University and his medical degree at the University of North Carolina. 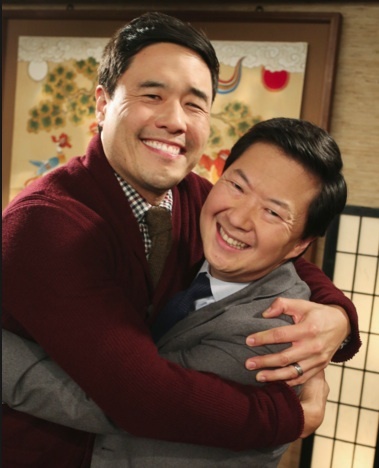 In television, he had a recurring role as Señor Chang on NBC’s “Community” and can now be seen starring on ABC’s “Dr. Ken,” for which he is also co-creator, a writer, and an executive producer. The show is in its second season. Randall Park, actor, and writer, one of the freshest and most in-demand actors in Hollywood with his extraordinarily diverse skill set and wide-ranging background in both film and television. Park currently stars in the groundbreaking ABC sitcom “Fresh Off the Boat,” as Louis Huang, the patriarch of a Taiwanese family adjusting to a new life in Orlando after moving from Washington, D.C. in the 1990s. The show is currently in its third season. He will also appear in the upcoming 20th Century Fox film “Snatched,” starring Amy Schumer and Goldie Hawn, premiering on Mother’s Day. Current major sponsors of the gala (as of March 20) include: Platinum Circle — ABC Disney; Gold Circle — Wells Fargo; Bronze Circle — Randall and Mari Tamura, Lynn Waggoner, Nielsen; Copper Circle — Snehal Desai and Friends, Asian Pacific American Friends of the Theater. More honorees and additional information will be released shortly. Gala Committee members include: Co-Chair Daniel Mayeda, Co-Chair Peter Shimamoto, Ken Katsumoto, Jay Kim, Carrie Lee, David Lee, Ed Lew, Judy Sasaki, Randall Tamura, and Lynn Waggoner. Honorary Committee members include: Jon M. Chu, Wenda Fong, Los Angeles City Councilmember José Huizar, Jeff Imada, Melvin Mar, City Councilmember Mitch O’Farrell, Los Angeles County Supervisor Mark Ridley Thomas, City Councilmember David Ryu, George and Brad Takei, and Janet Yang. The Hilton Universal City is located at 555 Universal Hollywood Dr. in Universal City. VIP reception for Premium Circle sponsors starts at 5:30 p.m. Silent auction and no-host cocktails start at 6 p.m. Dinner and awards show begin at 7 p.m. Individual tickets are $200- $1,500. Full table sponsorship packages are also available. For more information, contact Development Manager Monika Ramnath at [email protected] or (213) 625-7000, ext. 17. For more information about East West Players, visit www.eastwestplayers.org.